Hey everyone! My name is Liz, and I’m the creative gal behind the blog, Love Grows Wild. I am so excited to be the new cooking contributor here at Uncommon Designs, and I cannot wait to share my favorite tried and true recipes with you! 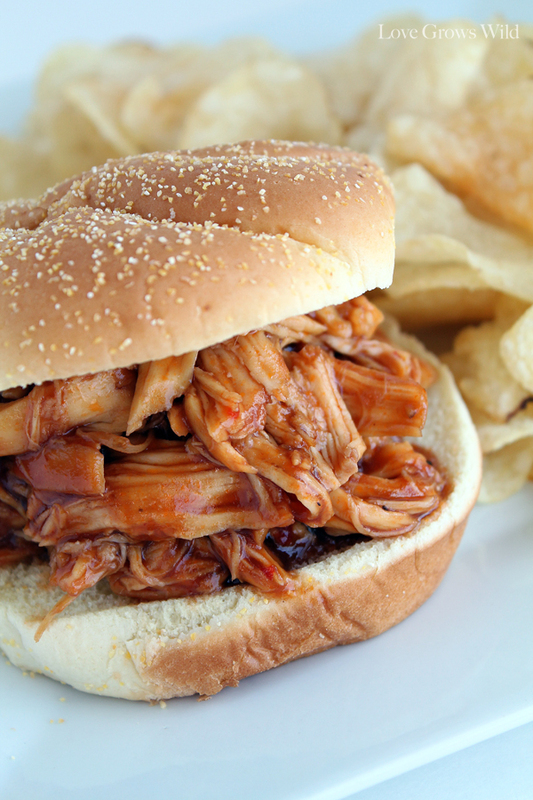 These Slow Cooker Honey Barbecue Chicken Sandwiches are the best! I’m a Mom of two very active little boys, and it seems like we are always on the run to baseball practice, school events, or something. I’m all about good, easy meals that I can put together even on busiest of days. My cooking style is a mix of wholesome, homemade meals along with some simple shortcuts to get delicious food on the table easily and quickly. Oh, and it has to be family approved too! 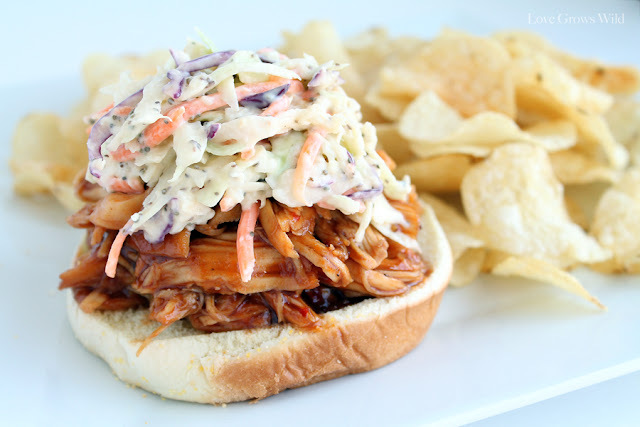 Today’s recipe for Slow Cooker Honey Barbecue Chicken Sandwiches combines the best of both worlds: It takes just a few easy ingredients thrown into a slow cooker in the morning, and by dinner time you have the most amazing barbecue chicken ready to eat! 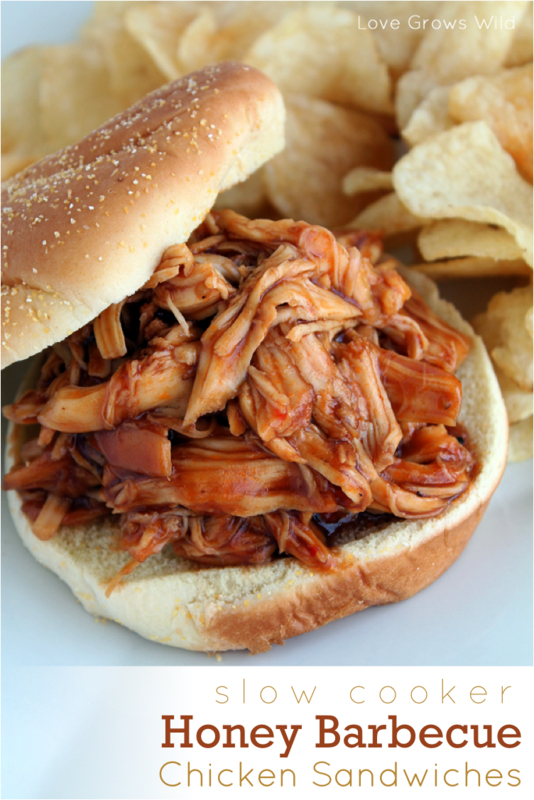 I like any kind of barbecue, but probably my favorite is with shredded chicken. It just tastes so good! I found this recipe (I believe) in a Kraft Food and Family magazine a couple years ago, and after making a few small adjustments, my family has been enjoying it ever since! I put three chicken breasts in the crock pot in the morning so they can cook all day and are ready to be shredded when dinner time rolls around. Most days I forget to take the chicken out of the freezer to thaw, but I’ve learned that the chicken still cooks perfectly in the slow cooker! So if you’re as forgetful as I am, don’t worry! The chicken can be thawed or frozen for this recipe! For the sauce, I mix a bottle of honey barbecue sauce (I like Sweet Baby Ray’s! ), some Italian salad dressing, brown sugar, and few dashes of Worcestershire sauce and pour it all over the chicken in the slow cooker. You can let it cook low and slow all day for 6-8 hours or turn it up to high for 3-4 hours if you’re short on time. When you’re ready to eat, shred the chicken with two forks and pile it up high on a bun! Don’t forget to drizzle extra yummy sauce on top! This recipe is usually enough to feed the four of us plus leftovers for the next day, but if you’re feeding a lot of people, go ahead and throw in another chicken breast or two. We love all the extra sauce this recipe makes, so there’s still plenty of room to add more chicken if you need to! The honey barbecue sauce has a great sweet and tangy flavor, but if you want more heat than sweet, switch out the bottle of honey barbecue sauce for a spicier barbecue sauce. Play around with the flavors to see which you like best, but this honey barbecue flavor is by FAR my favorite! 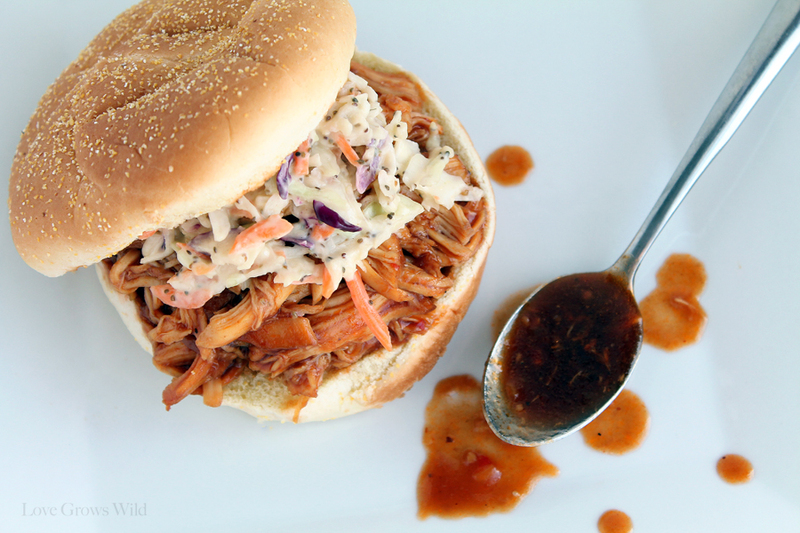 I like to cut the richness of the barbecue with some nice, cold coleslaw on top. I’ll be sharing my awesome homemade coleslaw on Love Grows Wild this weekend, so make sure you stop by to get the recipe! It is the perfect pairing with the Honey Barbecue! Shh… Don’t tell anyone I showed you these sneak peek pictures! I love how effortless this meal is to put together, and my family loves how delicious it is. It has the perfect balance of tangy sweetness and is great to make for large crowds! Summer cook-out anyone? In a bowl, combine the barbecue sauce, Italian dressing, brown sugar, and Worcestershire. Pour sauce over the chicken and cover with lid. Remove chicken from the slow cooker and shred using two forks. 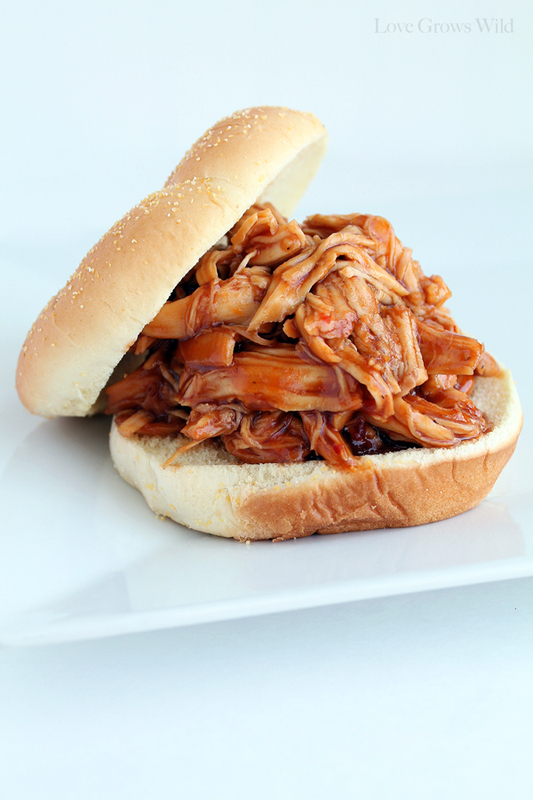 Return the chicken to the slow cooker to coat with sauce and serve on kaiser rolls. I’m so glad I could share this recipe with you today, and I hope you enjoy it as much as we do! I’ll be back next month with more yummy food, so tell me… What would kind of recipes would you like to see this Summer at Uncommon Designs? Love this recipe? Sign up below to get all of our recipes and projects delivered straight to your email inbox! Wow I can’t wait to try this! It looks fantastic! Everything about this is mouth watering! Can’t wait to check out the cole slaw this weekend! Looks delicious! Can’t wait to try it. I’m visiting from It’s Overflowing. I just wanted to let you know I made the HBBQ chicken recipe this weekend for a party I gave for my mom’s birthday yesterday. I had rave reviews from everyone. It was the easiest recipe I think I have ever made. Thanks for posting and please make sure Kim knows too. Looks delicious! I’m making this for my daughter’s first birthday party. In the interest of saving money, do you think turkey breast would work well for this recipe? THANKS 🙂 I can’t wait to try these tonight!!! Oops. Making these tonight. I bought original Sweet Baby Rays. Can I add honey? Thanks. I have made this several times with rave reviews from everyone who has tried it! Yesterday I was out of Italian Dressing and made it without…. big No No! It was ok, but was a bit dry and not nearly as delicious. Note to self… don’t make this unless you have ALL the ingredients on hand! (-: It’s perfect the way the recipe is written! Thanks for sharing this recipe. I recently made it for my boys for lunch and we loved it! I hope you don’t mind but I’ve shared your recipe on my blog site. Its such a great recipe that it is an absolute must share! This was a hit with my family! And I have a picky eater! My daughter wanted seconds!! Great easy and delicious recipe! Approx how many servings does this allow? I want to make it for a Superbowl party this weekend and want to make sure I can feed everyone! Love, love, love this recipe. It has become one of my standbys. Thanks for sharing it! Is the Italian dressing the creamy kind or the other? Absolutely! I just added you! Have a wonderful weekend! Can you use frozen chicken or should it be thawed? Thanks. The recipe calls for thawed. Can you do this with recipe with pork? Thanks!! We had it with chicken and loved it and wanted to make it tomorrow but only have pork! Sorry a bit late on your reply. I have not made it with pork, but I would assume it would taste great. You may need to watch it a bit closely as the cook time may vary. Let us know if you made it with pork and how it turned out! Sounds delish! Looks amazing! I’m making this tomorrow…what brand of italian dressing did you use? I know that this is an old post so i’m not sure i’ll get a response but…. I am not really sure how it would turn out as I have not done it that way. You would need to make sure it was covered and maybe watch it a bit closer. to keep from over cooking. But it is worth a try! thank you for your quick response! to play it safe i might just use two crock pots. i don’t wait a crowd of hungry people coming at me with pitchforks. 😛 thanks again! This is so up my alley! I cannot wait to try this! Can you please tell me which brand of Italian dressing you used? Thank you in advance. We are trying this tonight. Thanks for this. Just used it for my daughter’s going-away party and it was a HUGE hit! This is a wonderful recipe! I loved the flavor but the Italian Dressing made it a bit tart so I am going to minimize the dressing to 1/4 cup instead of 1/2 and just add a 1/4 cup more BBQ sauce. You will not be disappointed if you make this!